After I recently got back into working on my Mame Cabinet and following the forum I was looking at the high score competition they do here. That led me to look at the older ones and I stumbled on the Robotron competition from a year ago and I was like holy cow I didn't even know those scores were possible. I started playing it again and I've now logged 18+ hours on the game. 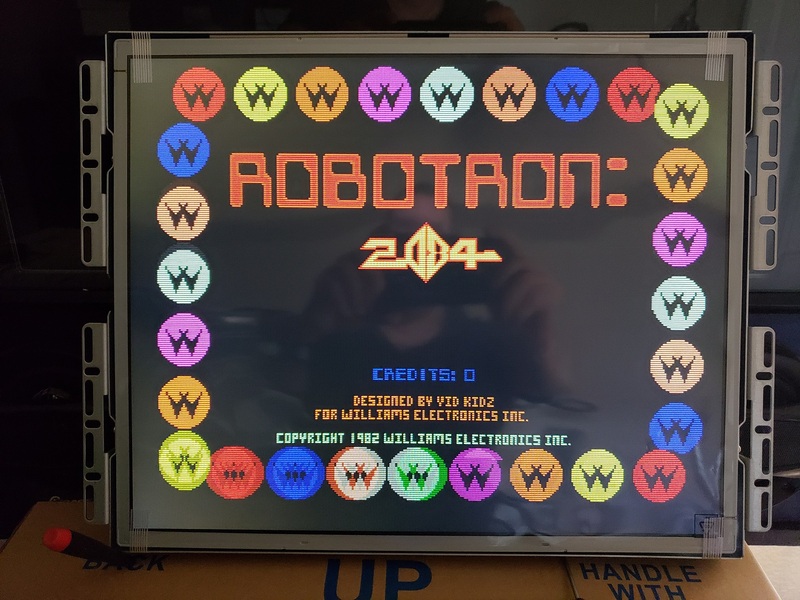 I decided Robotron is definitely one of my favorite games so I wanted to build a cabinet dedicated to Robotron but I'll make the control panel removeable so I can also make a Defender or other games panel down the road. 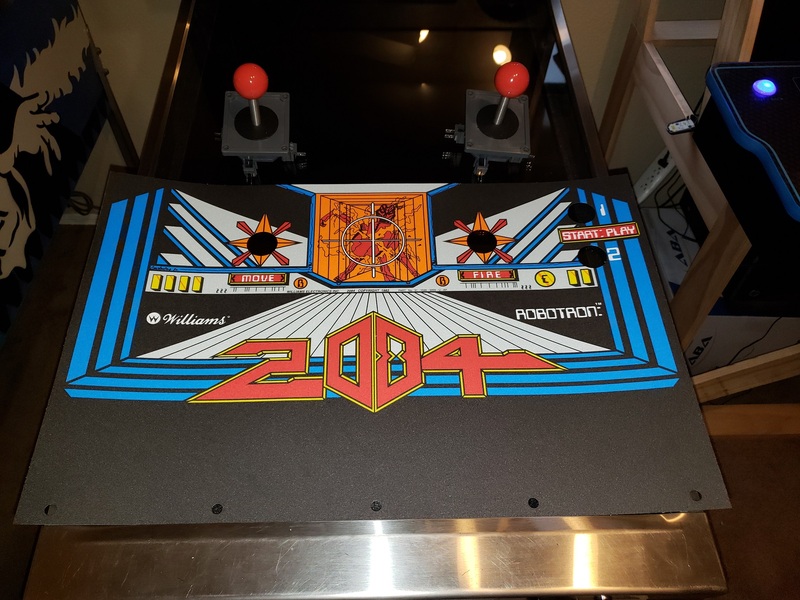 I've ordered several items to get started including a JROK SYSFPGA Williams card, Robotron control panel artwork and marquee. I've ordered 4" Wico joysticks from Arcade shop. Also my first item arrived today...a screen printed glass bezel. So these are some of the photos I've been looking at trying to decide shape and color scheme. For all I know these might be from someone here. I kinda like the way it curves under the control panel in the first 2 photos and I'm undecided on color scheme. I really like the black/red look of the middle photo. I find so many photos when searching I'm not sure which ones are original cabinets or clones like I'm making. 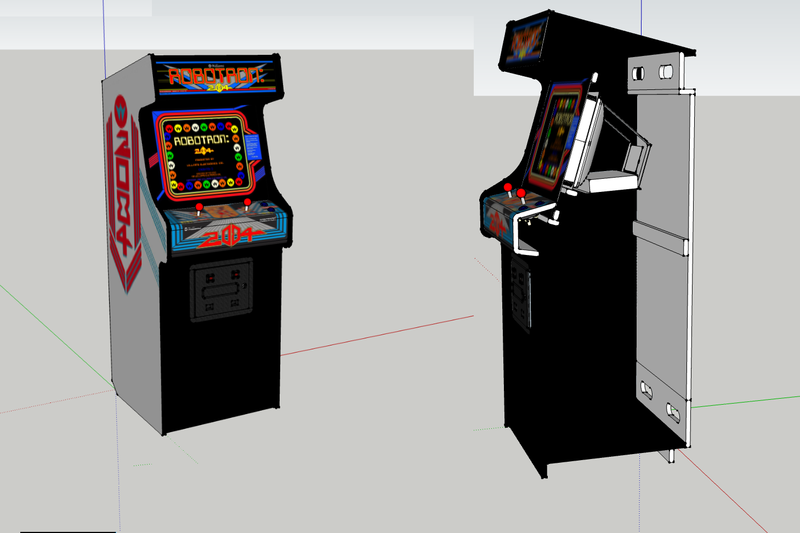 I believe in the US, the one on the Right is how it showed up in our Arcades.. All the best with your project, I completely understand where your coming from. I just built myself a Pedestal with the Jrok board in it.. Like just got the custom marquee today, still waiting on the custom control panel overlay.. Some more toys arrived. Last night I cut out a piece of ABS for a mounting plate and grabbed a 5V Meanwell power supply I had lying around. Seems like overkill to use a power supply capable of 60 amps for a board that only needs 400 mA but I had a box of 12 supplies I've accumulated for the Christmas light show I run. I also got the control panel artwork and marquee and Wico style joysticks along with several other odds and ends. 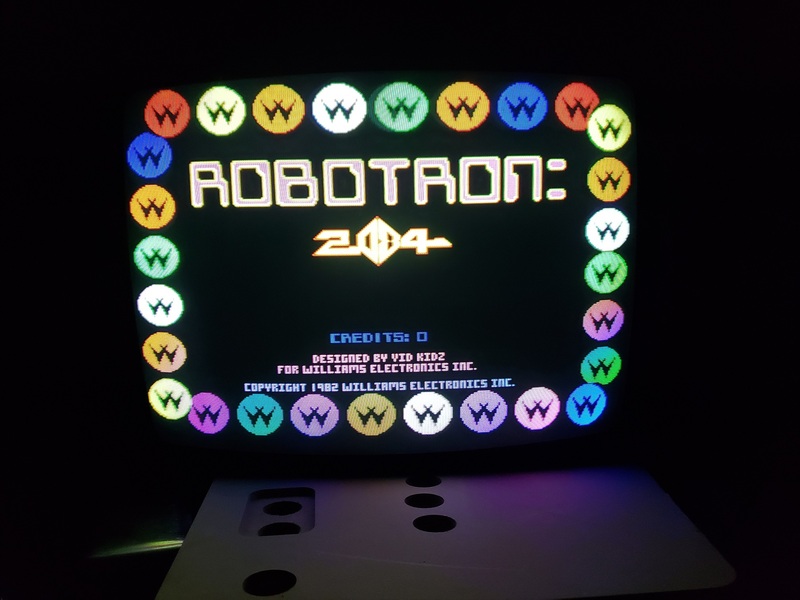 Robotron is a game I want to own someday. I will be watching to see how this one turns out. Well the board works. I temporary hooked up a joystick and 2 buttons to get through the Setup Menu. 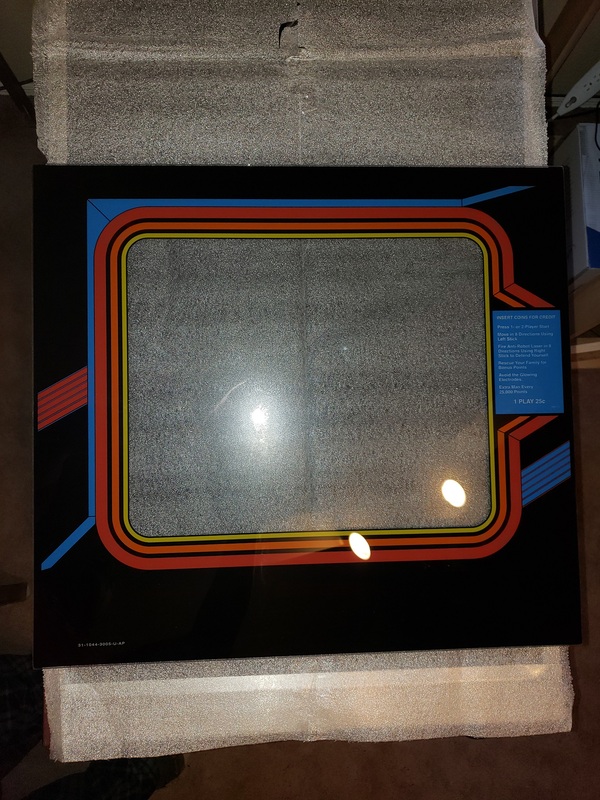 I mentioned this in my other cabinet build thread but I had bought a Vision Pro 19" LCD because ArcadeShop listed it as what is used as a replacement in old arcades. So it was already on order when I started reading that I really should use a CRT. So I've got the LCD working but I'll be trying to find either an arcade CRT or a good TV to use. I got a 20" Magnavox TV but it only has composite so I've been told I really would need to modify it to accept RGBS. After I got the LCD working I switched over to trying out the JROK RGB to NTSC encoder with its composite output but I'm getting nothing but some unregcognizable flickering on the TV. I know the TV input works with my Nintendo64. When I first got the LCD working I could not get the scanline emulation setting to work then I finally noticed the VGA jumper on the board. I only mention it to point out I did not have the jumper in VGA mode when trying to get the TV working I just moved it to VGA mode when I switched back to the LCD. Great choice on the JROK board. I've installed one in my original cab, and it's been solid for years now. Too bad about the LCD, but since you already had it on order might as well use it. You just might not get the quick response of a CRT, something that Robotron really needs, but it'll get you by. As for painting, the black/red one you've mentioned is actually the Euro version of Robotron, while the other two I believe were state-side. The lighter gray (it's actually pewter) is the more common cabinet, and is also the same for the cabaret/mini version (that's the cabinet I own). Looking forward to your progress on this one. 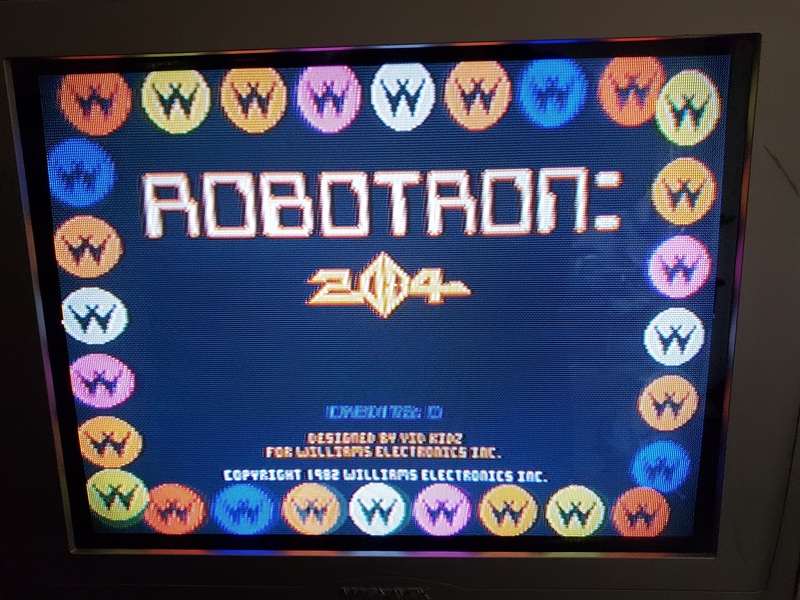 Robotron is one of the greatest games ever made! Thanks opt2not I've looked over the thread where you restored that cabinet and I saw your comment about the black/red scheme. I almost decided on it but I think I'm going with the lighter grey. I agree its one of the greatest games. Seeing your high score when I looked at the old thread from last year is what prompted me to spend more time trying to get better. 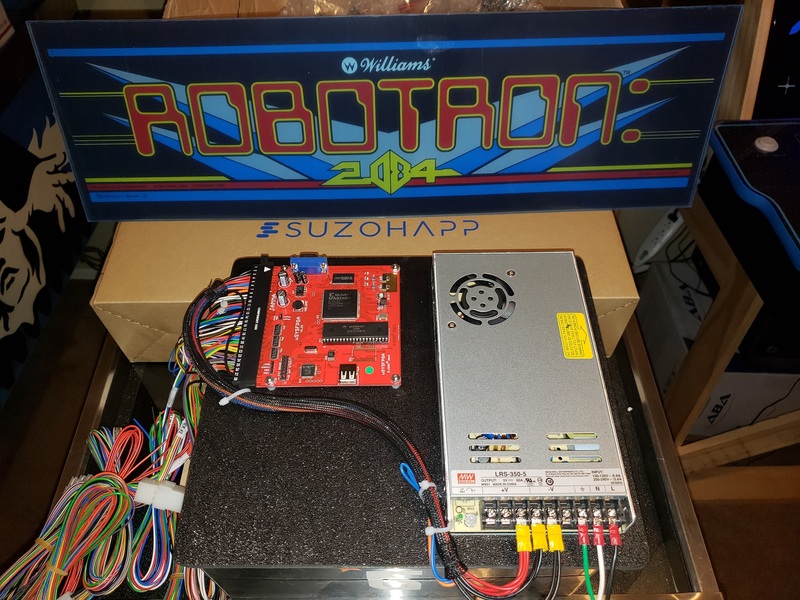 Are there sign-ups for your Robotron training at ZapCon? LOL....I hear there's a line. Ok I pulled out the voltmeter and checked continuity and my sync line was open. The encoder board came with these super tiny wires that break easy. So I got the TV working but its not that great. I know its only composite but the Nintendo64 seemed to be looking a little nicer plus the image seemed aligned on the Nintendo whereas this one is off the screen a bit and I don't have a remote to access any adjustments. Hehe, yeah man, I'll show you some moves at Zapcon this year. Last year they had an original and a repro cabinet on the floor. I didn't play much of the repro cab because it didn't feel as sturdy as the original. Perhaps a combination of non-original controls, and the type of wood they used for the cab. I'm trying to get Yots to pitch a Robotron competition this year. Last year there were Galaga and Cyberball tourneys (I entered the Cyberball one, but didn't do Galaga). Robotron would be a fun one, especially if it's set for tourney settings -- 5 lives, no extras, level 10 difficulty. Yeah well I'm still at only 238,000 for my high score since I started playing again a few weeks ago. One of the biggest things that gets me is trying to handle the shots from the Brains. And the tank wave can go really bad...sometimes I breeze through it then other times I lose all my guys. I need to see if I can find an original cab somewhere near me so I can rediscover how the joysticks feel. The Wico joysticks I got from Arcadeshop feel really stiff but of course I don't have them mounted in a panel yet. I also want to see how much they are supposed to stick up through the panel. I ordered the metal blank for a control panel but not sure if I'm going to use it on this cab or just get measurements from it to make one out of wood. tourney settings -- 5 lives, no extras, level 10 difficulty. Tried that. I think I lasted longer on prom night. I'll have to see that demo if I make it out this year. I got part of the cabinet designed in SketchUp yesterday. I found build plans at classicarcadecabinets.com but it listed the accuracy at 88%. I also tried importing a cabinet from the SketchUp Warehouse but there were parts of it that didn't look correct like the control panel was parallel to the floor. 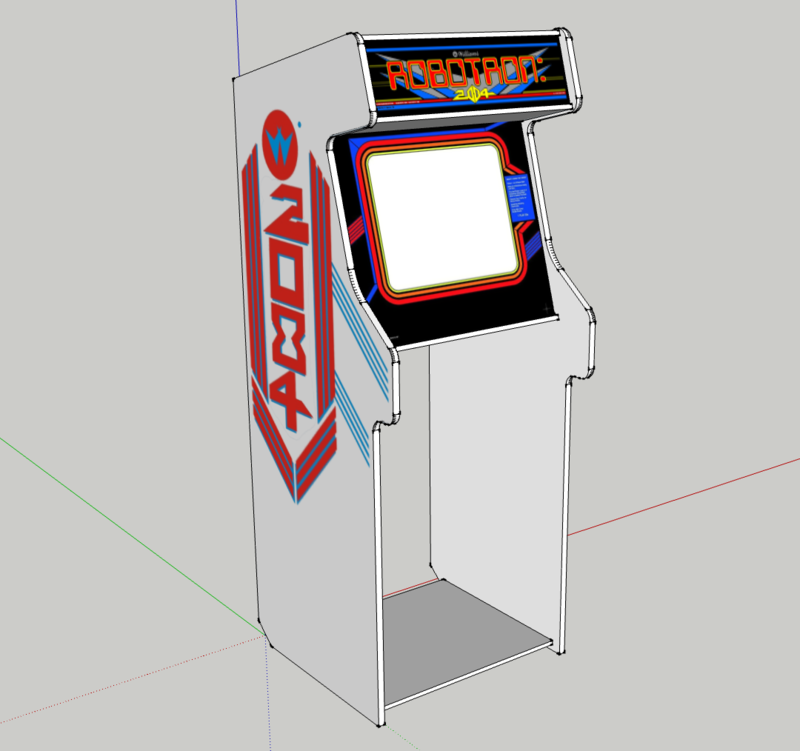 So I ended up placing an image of the Robotron-1 cabinet profile image into SketchUp and I matched it's height to the cabinet that I had imported. Then I traced the shape and extruded into a 3/4" piece. After my parts arrived I measured the dimensions to try to figure out the width I needed to use. The control panel blank = 24 5/16", Marquee = 24 11/32", Bezel = 24 1/4". So I'm still trying to decide what the internal width should be. I'm not sure how much tolerance I should leave and whether the glass bezel needs plastic trim on the sides. I have some leftover trim from the pinball project and it measures about 3/64" thick so putting it on each side adds 3/32". 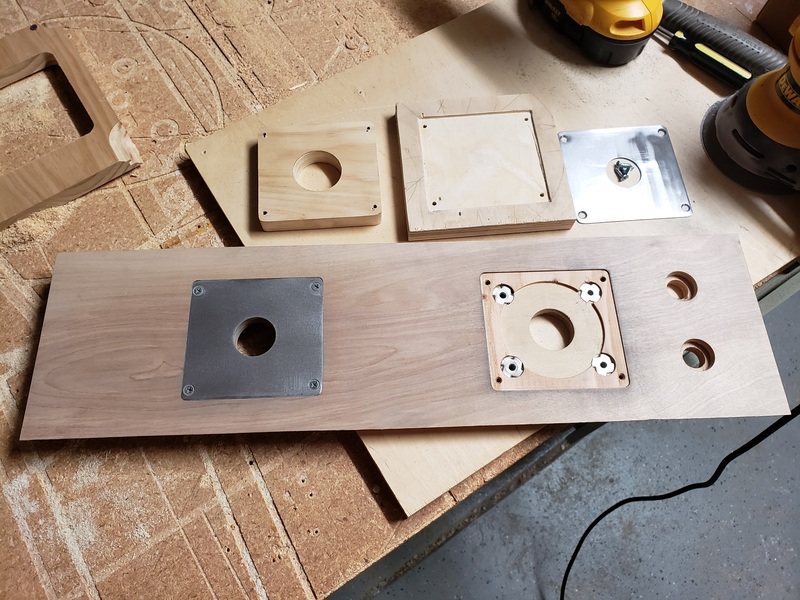 So if I went with 24 3/8" and used trim on the bezel it would only leave like 1/64" spare on each side to slide those parts in between the panel sides and 1/32" spare on each side for the control panel. That just seems cutting it kinda tight so I'm curious what you other builders do when deciding something like that. I've been searching all over finding photos that show how these things were built. I ran across this speaker panel image. I can't seem to find where I could buy a trim piece to hold the marquee like that. It gives it a nice look since you can screw it to the wood on that lip. I finished enough of the SketchUp design I can start doing some cutting. 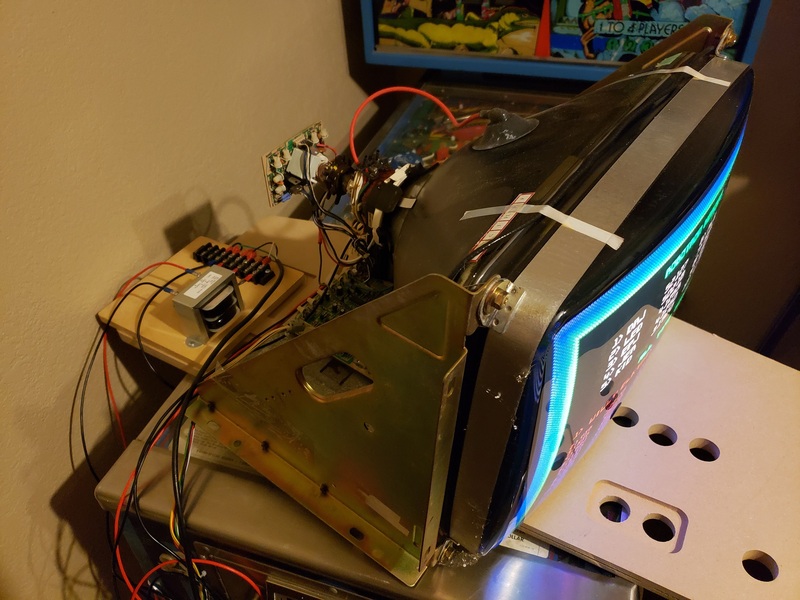 I ended up buying a used 19" Wells Gardner arcade monitor so I'll wait till that gets here to make sure it fits. So I'll start on the control panel first. I'll share the SketchUp design file once I finalize everything. Always one of my favorite cabs. Great choice on the sides, and nice SketchUp work! I remember scratching my head on that one for quite awhile as well. Nice work. Got the top piece of the control panel designed and cut tonight. Took me the entire afternoon/evening to make these metal plates. I don't have anything that can precisely cut metal so these were made by hand with a jigsaw, drill press, and belt sander. At first I tried to cut the center hole with a jigsaw and realized that was going to look terrible. So I googled for ways to cut a hole in thin metal and found a guy cutting a hole in 1/4" steel using a normal hole saw. The key was keeping it lubricated when it begins to smoke. So I ran to the store and found a Milwaukee hole saw with a thin wall and I used machine oil to keep it cool and it cut the holes out really nice. The other thing I messed up on the first attempt were the 4 holes. I marked lines with calipers and punched marks but it didn't quite line up good. So this time I went back into Aspire and design a couple jigs. The jig on the right was used to put the plate in the pocket and flip it over and drill the holes. Then the one on the left with the hole I used to attach the plate and then round the corners with the belt sander. Then I just had to countersink the holes. The pockets were cut with a CNC and still there were a couple edges where I could feel the metal lip. I've had to spend time trying to thin the metal plates on a couple of the edges. I assume it needs to be pretty close to perfect flat to not show through the overlay. 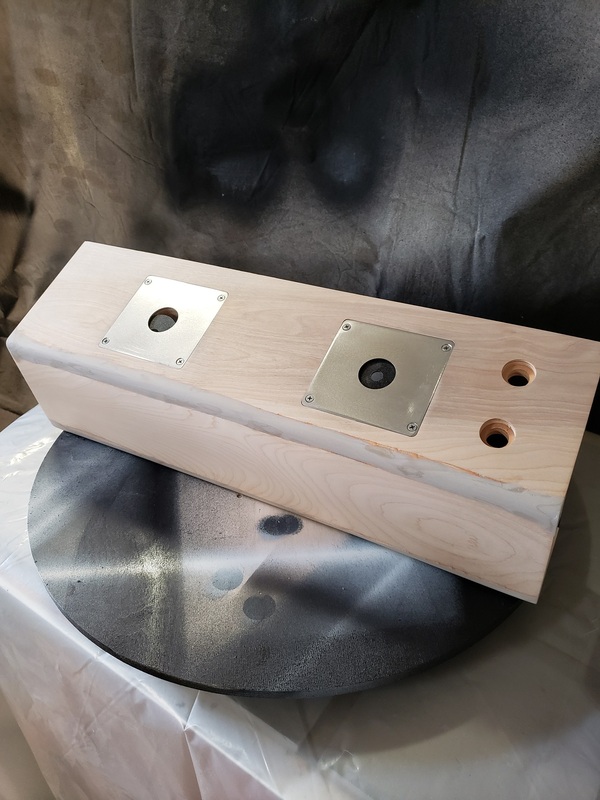 You can do almost all metalwork with a file and infinite patience, but a hole saw and a belt sander drops the required patience factor down to something more plausibly realistic. I love to see people just diving in and doing it with what they've got, instead of thinking that it can't be done because they don't have a full machine shop. Is the circle in the middle for the dust washer? Yes. I wouldn't have even known about it but from all my searching that is the way it appeared the original control panel was designed. Yeah I know I'm fortunate to have the CNC. I think I got it for a lame reason like cutting out coro shapes for Christmas decorations but I always wanted one and knew I'd find other uses for it. 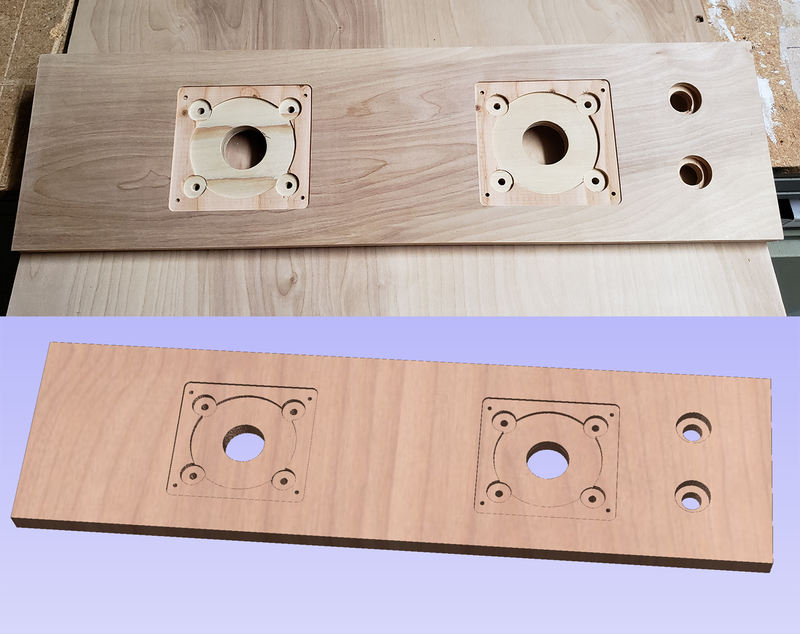 I used the CNC to make the jigs for helping with the hole alignment and corner rounding. I admire the builders that get those tasks done with less. That project is turning out quite nicely ... A few years back I sold all my vintage equipment and downsized into a tiny little home shop, It's not real easy to be creative with less. Excellent work so far. That metal plating turned out great! Well now I got an error to fix. Luckily it just a little bit of plywood with not anything too critical invested into it except the time to create a 14 degree miter joint. I went to glue the top piece to the 2 bottom parts I had glued together and I'm like how the heck are they that far off I cut the darn things with the CNC. Then it hit me the same thing had happened with the jig I had cut and these were done before that. Instead of just cutting these simple rectangles on the table saw I said I'll get fancy and let the CNC cut them. Well when I jumped into the design tool, dropped down a couple rectangles and created the toolpath I didn't notice it was still on an 1/8" end mill bit that I had used last for a small hole instead of a 1/4" end mill. So the toolpath I created expected an 1/8" bit in the CNC and I was using a 1/4" bit so the board ended up a 1/4" short. Well back to the store for another small piece of plywood. Well no new photos to post yet. I got the boards cut again properly and the control panel is glued together. I started rounding over the corners for a curve. It was difficult trying to route the miter joint with the boards held at an angle so the joints have some small gaps. I know the joints are strong though because I tried to break the one apart I had glued yesterday that turned out too short and I literally stood on top and jumped and it wouldn't budge. Had to grab a maul to break the joint. So where I rounded the curves into the panel there are some thin gaps I need to fill and sand down. 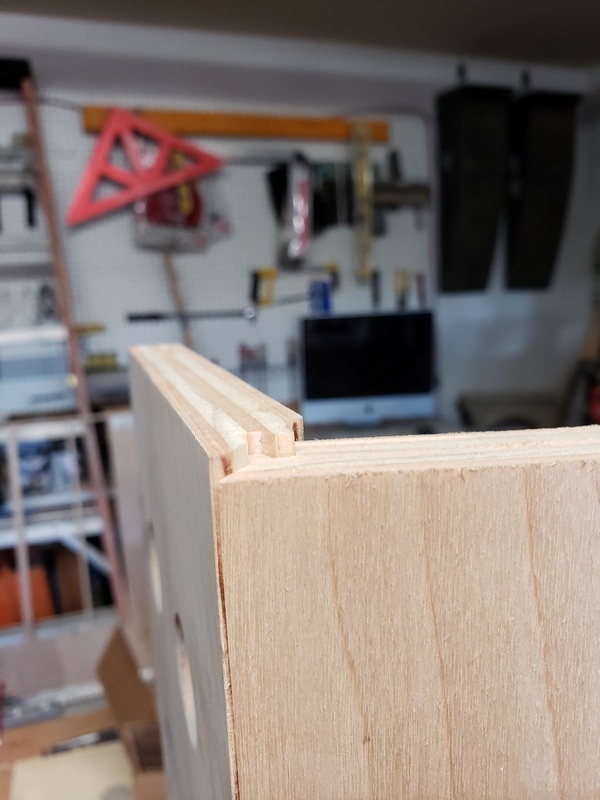 In some spots there is no gap and other spots its so thin I'm not sure I can squeeze filler in there so I'm thinking it might be better to go ahead and just run a groove through there with the table saw so that the filler is thick enough to hold. Seems like I see people using bondo for this. I've never used it before so gotta track down where to get it and try it out. I thought that was mainly auto body repair stuff. Got the control panel almost ready to be wired up. This is before I put a coat of paint on it. Mainly just to make it black since anything visible is going to be covered by the overlay. A few things I would do different so you can learn from my mistakes. Don't try to make the holes too close to the exact size....even a CNC can be off a mm depending on bit wear etc. I tried to cut it too tight and the button holes were about 1.5mm too small. Second error is forgetting to test fit the buttons before putting on the overlay. To fix the button this works nicely. Grab a scrap piece of wood and drill your hole in it. I like to use a Forstner style bit for this. Then secure the template hole in place and use it as a guide to widen the hole. I installed the joysticks and buttons to see how it looks. I'm happy with it. I love the crisp look of that artwork! You've got some serious skills man, hand forging those steel plates? Slick! 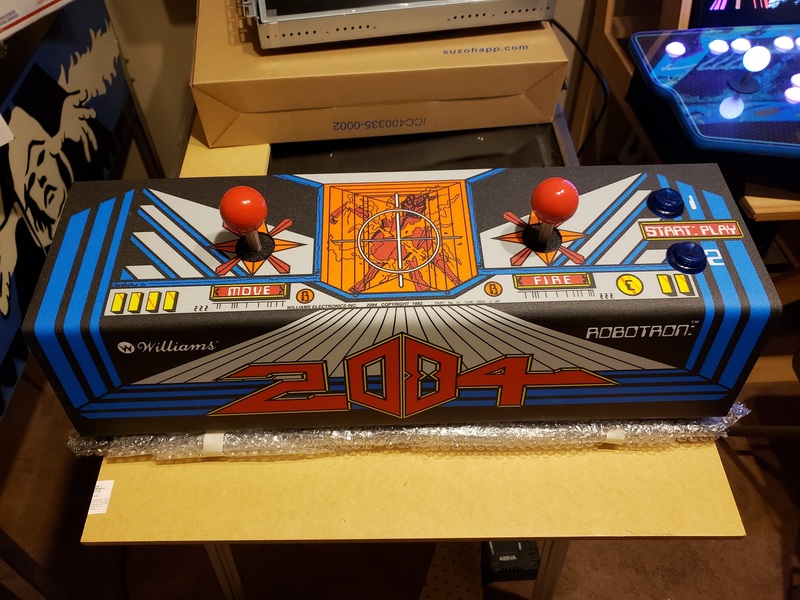 Yeah I didn't use my artwork when I was buying stuff from ArcadeShop I noticed they sold the Robotron overlay so I got the one I believe they sell for real cabinet restores. It was really a pain aligning it though because it was already cut to the exact size. I acquired a Wells Gardner K7000 CRT for this build. It arrived this afternoon and it appears I guessed all the wiring correctly. I notice when there is a lot of dark background it seems to have a bit of a venetian blind effect with maybe a green tint. I haven't tried to adjust anything cause HORZ/VERT position and size are about all I know currently. Man, you are doing this build right! Love the K7000’s. Next to the G07’s, this monitor is very serviceable. The colour looks like a purity issue in the title screen shot. The lower right seems off to me. Could use a degauss, but if the monitor’s degauss isn’t working well enough, a degaussing wand might do the trick. Or you can try adjusting the purity rings. As for the bleeding greens, you might want to adjust the R G B balance pots on the neck board. Other than that, wouldn’t hurt to throw some new caps on the chassis. Yeah I noticed the bottom right corner after I posted and ran the color screen test and it had blue all over the red. I messaged the guy I bought it from and got some tips. Degaussing was one thing but he noticed I had it on the pinball machine. I moved the monitor to the floor and 80% of the blue went away and now its just a bit in the corner. I ordered a degaussing coil already. If the monitor had it built in I didn't know it because I googled for degaussing a K7000 and the first video I watched he used a coil so I bought one...lol. The ebay ad said the "chassis is rebuilt" so I didn't know if that meant it was recapped or just something physical was rebuilt. It looks really clean and in good shape. Yeah one of the monitor gurus here can probably explain it better, but from my knowledge that black wiring going around the back of the tube that looks like it’s wrapped in electrical tape is the deguasser. Normally the monitor deguasses automatically from a cold startup (at least 20 mins turned off), but sometimes you need a more powerful degaussing tool to get the job done. Magnetic interference from the pinball table might have been it but I’d let it sit on the floor away from magnetic fields for 20+ minutes then try the power again and see if it clears up. A rebuilt chassis probably means the seller most likely replaced the caps. Could be a combination of things replaced, but caps are usually part of the rebuild servicing. I’ve got a k7000 sitting in the garage waiting for my next project. I should try to get it as clean as yours! 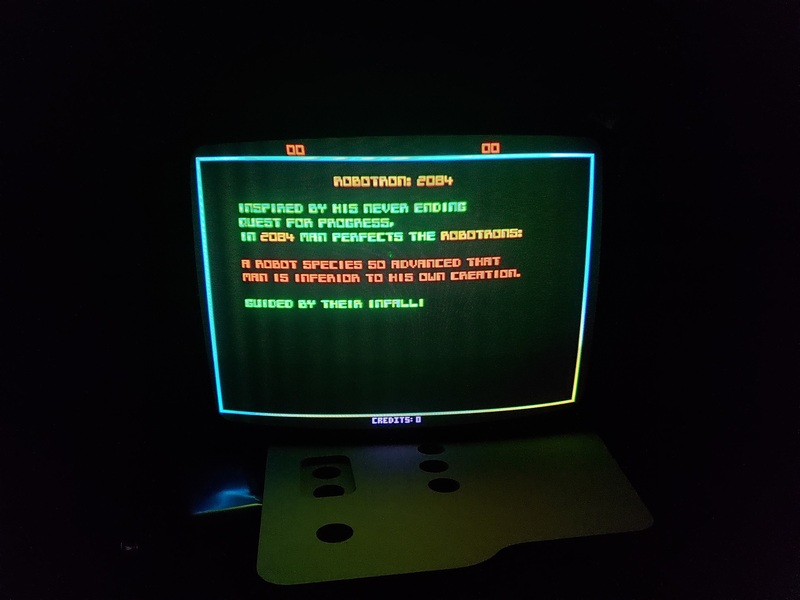 I really want to play a real Robotron to see how the joysticks feel but it might not be till ZapCon. But even then a real cab might have joysticks that are more worn in. I temporarily wired up my control panel and played with it sitting in my lap which isn't optimal but the Wico Joysticks from ArcadeShop are feeling really stiff. And it seems like you barely move them to activate the leaf switches which maybe will turn out to be what you want for quick response. I've just gotten so used to the loose ServoStik feel its going to take some getting used to. Its cool to see it all working and now I'm really motivated to get the rest of the cab built to put it all in. I asked the seller and he says this monitor has new caps and a new flyback transformer. I'm feeling pretty good about getting it now especially since I got an unexpected delivery of donation money last night from the lighting project I help develop that more than pays for this entire cabinet. Now the wife is feeling better about all the stuff she's seen showing up at the door...lol. Neat to see a scratch build, looking good, nice work! A degaussing coil should get rid of the color variation in the corner. Whenever you move a monitor, change it's location, direction it faces etc. it can be effected by magnetic fields and discolor portions, a degaussing coil will fix this most of the time. Interestingly, in a pinch, an electric drill will work as well though not as effectively as an official degaussing coil. After hitting it with the coil you'll want to adjust the focus and brightness on the flyback, those will have the next biggest impact. After that you can look at the convergence and color purity. They seem to be ok from the pics you posted so you probably won't have to mess with them but there are tutorials all over the place online for making those adjustments.